[BB-Blog]: Lincoln Park Black Torchiere. Okay. You guys are gonna think I've lost my mind (a tochiere lamp on my blog?!) but hear me out. I bought one of these at Lowes this weekend because I needed more light to paint. (No overhead light in the room.) This lamp is GREAT. It gives off the same bright, warm, dimmable light as a halogen lamp but the bulb is only 55 WATTS AND the lamp costs around 40 bucks. Replace your halogen torchiere with this compact fluorescent torchiere. Halogen torchieres typically consume 300 watts of electricity, the lamps get as hot as 800 degrees Fahrenheit, and if used 4 hours each day at $0.08/kWh the annual operating cost will be $43.00. This compact fluorescent torchiere uses 63 watts of electricity, the lamp runs at about 120 degrees Fahrenheit, and if used for 4 hours per day the annual operating cost will be $7.36. 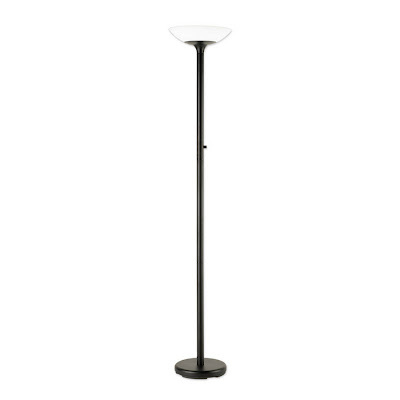 This Good Earth Torchiere comes in a black finish with a solid bowl, directing all of the light upward. The dimmable 55 watt 2-D compact fluorescent bulb will provide a light level roughly equivalent to a 250 watt halogen torchiere. The bulb is rated to last for 10,000 hours. The torchiere itself stands at 72 inches high, and weighs 16 pounds. This is a wonderful post! All the other posts say exactly the same thing I am thinking. Anyway, thanks for sharing.